The OccuNomix Men's ECO-G Orange Class 2 High Visibility Mesh Safety Vest is probably the lightest piece of safety equipment you’ll have with you on the job site, however it is worth its weight in gold. Manufactured with 100% ANSI polyester tricot, this bright ... (see full details) (see specifications) #OCCECO-GORG. 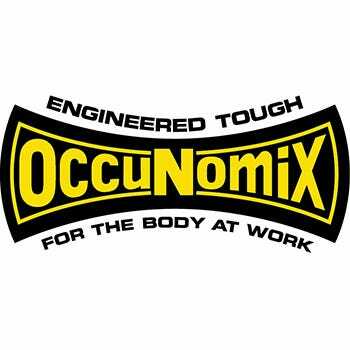 The OccuNomix Men's ECO-G Orange Class 2 High Visibility Mesh Safety Vest is probably the lightest piece of safety equipment you’ll have with you on the job site, however it is worth its weight in gold. Manufactured with 100% ANSI polyester tricot, this bright orange safety vest will make you stand out like a sore thumb--and that’s a good thing. Whether you’re working on a highway project with cars speeding past you, or on a massive land development site, you want to be sure everyone can clearly see you at all times. In addition to the bold and bright orange color of this OccuNomix vest, the ANSI/ISEA 107-2015-compliant, Class 2 reflective tape will keep you safely visible. Two shoulder stripes and one 360 degree horizontal stripe (both 2 inches wide) shine brightly on this high-vis vest even in low light to keep you brightly lit up. With its large-hole mesh fabric, this ECO-G vest is extremely breathable to keep you dry and cool. The last thing you want to do on a humid day with the temperature hovering right around 100 degrees is to wear any extra layers of clothing. This feather-light Occunomix vest feels like you’re wearing nothing at all. In addition hook and loop closures securely keeps your high visibility vest closed, so it won’t go flapping all over the place when the wind kicks up. OccuNomix Men's ECO-G Orange Class 2 High Visibility Safety Vests might be light in weight, but it’s heavy in keeping you high-visibility safety. Order your premium vest online today from the Working Person's store. This is an item I keep in my saddlebags on my cruiser so when traffic gets really heavy I want to ensure that I be seen and this works to my advantage as I wear it over my shirt. I know I can be seen easily and people notice which is what it's for...to be seen and for others to know I am in the area. Occunomix Vests: Men's ECO-G Orange Class 2 High Visibility Safety Vest is being added to your cart.